These beetles emerged from screwbean mesquite pods I had in a jar. I have the specimens and a dissecting scope, so let me know if there are tiny characters I should look for to get to species. Moved from Amblycerus. Well, the images look reasonable to me... the microscope will have to wait for another day. Host plant (Prosopis pubescens) makes sense, but I'm curious what the defining characters are. I've still got the suckers in my jar o' mesquite pods, so I can look for things not shown in the photos. Moved from Pea and Bean Weevils. I think I can see the big one on the hindtibia on the other picture. Yes, it has them, and that is what you're seeing on the other picture. They're not as long as the spines in the image you linked to, but if the presence of any spines indicates Amblycerus, I'll move these to the page for that genus. Yes, you can move it to genus level. Amblycerus has two spines; one big one and one small one (but you´ll have to look very good for the latter), but from the general look I´m pretty much convinced it is Amblycerus. There is one other genus with spines, but that one has two evenly long spines. 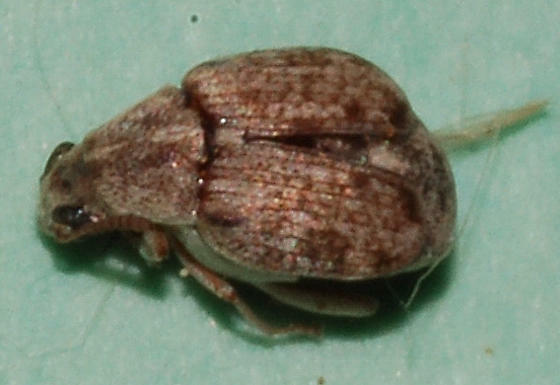 Although my images don't show them, you are correct that these beetles have one large and one small spine. Thanks for your help.